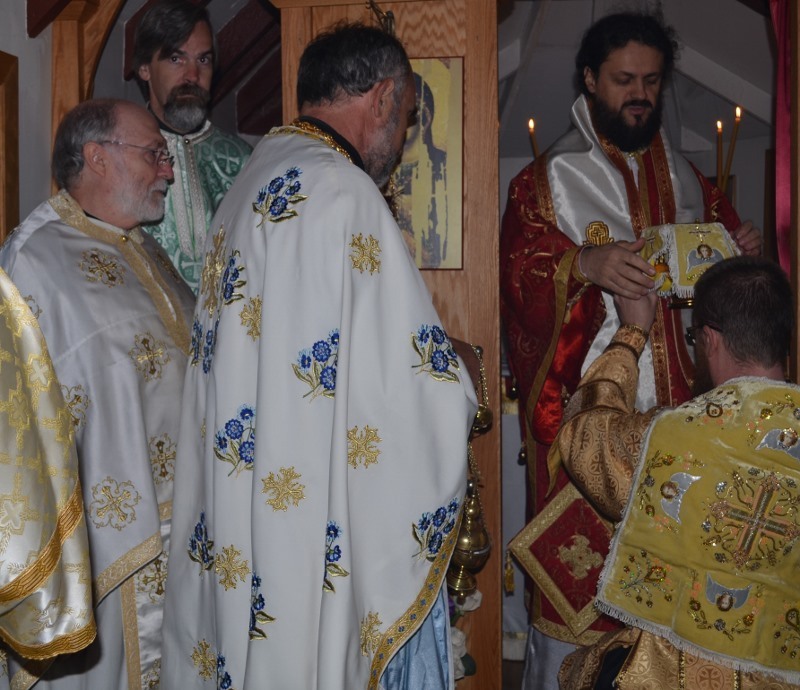 Wildwood, CA - On October 9/22, the commemoration day for the Feasts of holy Apostle James, St. Stephen the Blind, and the “Korsun” Icon of the Most Holy Theotokos, His Grace Bishop Maxim arrived at St. Xenia Skete in Wildwood, California, to the ringing of bells for the Divine Liturgy. 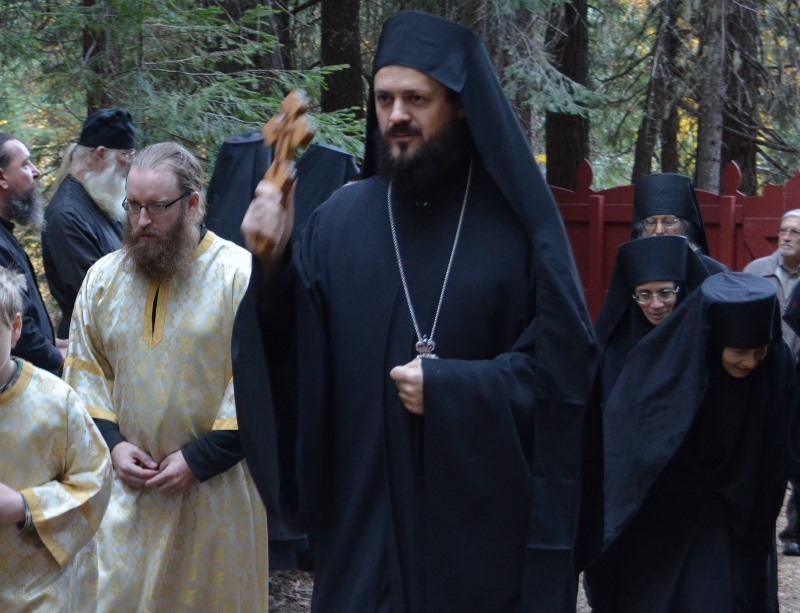 Clergy attending the service included Protopresbyter Dane Popovich of the Assumption of the Virgin Mary Serbian Orthodox Church in Sacramento; Priest Nektarios Rozadilla of St. George Greek Orthodox Church in Redding, California; Abbot Damascene (Christensen) and Hieromonk Paisius (Bjerke) of the St. Herman Monastery; Priest George Eliott of St. Andrew’s Serbian Orthodox Church in Anderson, California; and Father Deacon David Greenfield of Sts. Cyril and Methodius Orthodox Church in Chico, California. Rev. 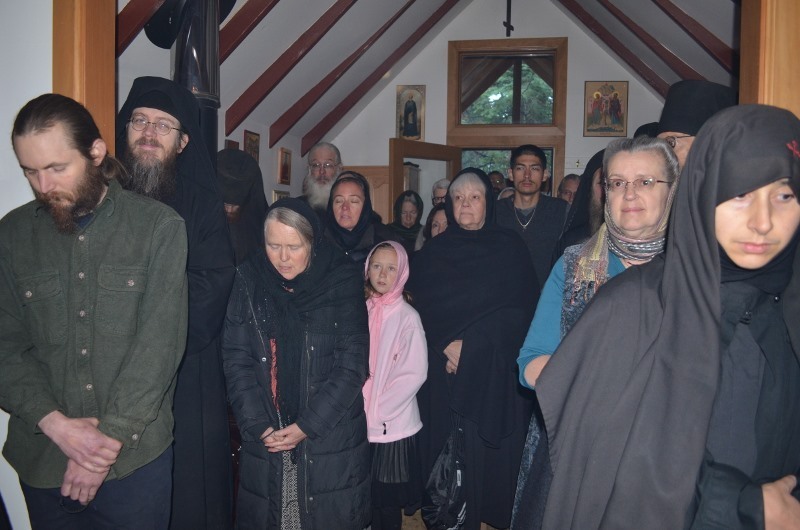 Mother Abbess Markella of the Living Spring Greek Orthodox Monastery in Dunlap, California, attended with two of her sisters, bringing her warm and loving support. Quite a number of the faithful were also present from Redding, Sacramento, and San Francisco, California; Ashland, Oregon; Walla Walla, Washington, and Reno, Nevada. His Grace Bishop Maxim served a beautiful hierarchical Divine Liturgy with an inspiring homily, emphasizing the labors and loving sacrifices which the Apostle James and other spiritual instructors freely gave to help bring true disciples to Christ our Lord. At the conclusion of the Divine Liturgy, His Grace served the rite of elevation with prayer and blessing for nun Dorothea and the sisters, installing her with Cross and staff as Abbess of St. Xenia Skete, and encouraging her and the sisters with His pastoral exhortations. A time of fellowship with refreshments followed for all in the trapeza and on the grounds of St. Xenia Skete, before the festive meal at St. Herman Monastery, lovingly prepared and offered by the monks for this joyful occasion. Rev. Mother Abbess Dorothea and sisters wish to express their sincere appreciation to His Grace Bishop Maxim for all of his loving pastoral support and episcopal care.